Set during the 1920s, “The Lost City Of Z” centers on the legendary British explorer Percy Fawcett (Hunnam), who ventured into the Amazon jungle in search of a fabled civilization and never returned. Robert Pattinson co-stars as his fellow explorer Henry Costin, and Sienna Miller plays his his wife Nina Fawcett. THR reports that Amazon has stepped up and acquired the North American rights to the film, adding yet another recent film by a major auteur to their already impressive roster which includes Woody Allen, Park Chan-Wook, Nicolas Winding Refn, Jim Jarmusch, and more. As per usual, the streaming service will team up with a distributor to get the film in theaters, with Paramount Pictures as possibility to fill that role, which means you can probably expect a wide release for the movie. However, the question remains: when? 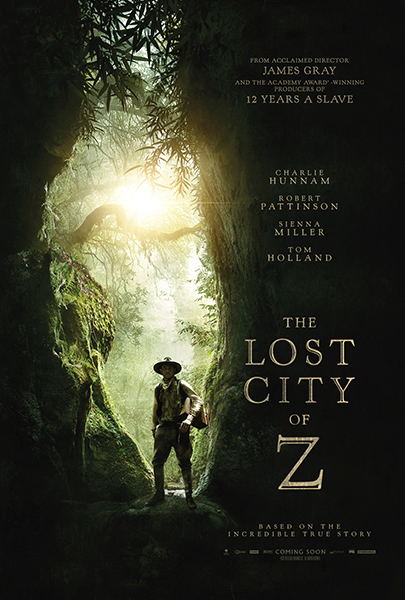 Based on the book by David Grann, and starring Charlie Hunnam, Robert Pattinson, Sienna Miller, and Tom Holland, the film will tell the true story of Lieutenant Colonel Percy Fawcett (Charlie Hunnam), the British military-man-turned-explorer, whose search for a lost city deep in the Amazon grows into an increasingly feverish, decades-long magnificent obsession that takes a toll on his reputation, his home life with his wife and children, and his very existence. They should change their logo. Or maybe I'll get used to see Amazon at the beginning of a trailer/of a movie. Totally agree. That logo looks so cheap and out of place. They should turn it into chrome or something. loved this. not quite the masterwork that the immigrant is, and i'm well aware that i'm in the minority in considering it as such, but it's gray continuing his full pursuit of what he refers to as the "middle", where cinema is at once truthful and spectacle, and it's a joy to behold. rich, sensuous, transcendent. the collaboration between gray and darius khondji is invaluable. hope they continue to work together for the rest of their careers. I loved this and can't quite explain why. I think it's just very deeply centered by Charlie Hunnam's performance, which is full of humanity and compassion. I had the impression that this might be boring, but it was quite the opposite. There are actually a number of time jumps — you never really know when they're going to happen or which typical plot points the movie will glide right past. I've never seen that done quite this way before. I have also never seen this subject covered with such nuance. I mean, they actually encounter a cannibal tribe, but the film (like Fawcett) absolutely refuses to freak out about it. Instead, it instantly swerves into this deeply respectful and reverent curiosity for fellow human beings. The degree of difficulty here is seriously impressive. Film Comment has it #9 on their best films of the year.